Jeb Bush sang a different tune towards immigration than his Republican colleagues. "Yes, they broke the law, but it's not a felony. It's an act of love; it's an act of commitment to your family," Bush told Fox News host Shannon Bream at town hall event at the George H.W. Bush Presidential Library Center. The Republican Party base has recently shown no love for candidates who talk about the need for compassion in dealing with undocumented immigrants. But Bush has warned Republicans that they must be more inclusive and more willing to compromise with Democrats to get things done. Could Bush's more inclusive attitudes work for getting the bid in 2016, or is he alienating himself from his base? 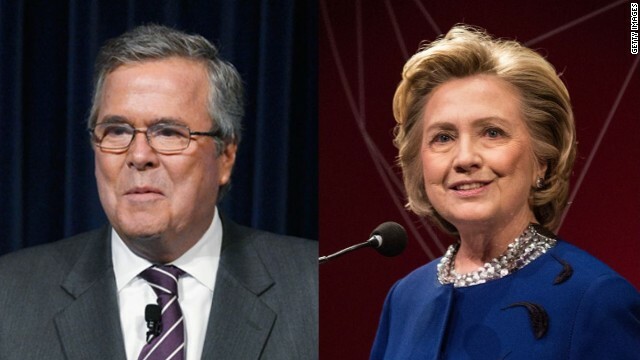 We want you to weigh in: Do you think Jeb Bush can beat Hillary Clinton in 2016? To see who the real traitors to the US are. They're certainly up there on the list. Let's face it, both sides are still able to get most people to buy and drink their flavor of Kool-Aid, but it's just different flavors of the same brand and both flavors are making the American People and the Real American Economy sick. Economic Fairness for the American People and the Real American Economy: It's called Tariffs, VAT and Protecting Our Southern Border. Historically it always was that Republicans represented management and the Democrats represented labor and the reality was that there wasn't any good guys versus the bad guys, as the case is today, they all literally have faults and at any particular time one was just more needed than the other with the pendulum swinging first too far one way and then back too far the other way. Today, as has been clearly evident especially since 2000, the pendulum has swung way too far to the right with the GOP becoming "puppets", totally owned and controlled by "the money", and with the finances, power and influence provided, they just concentrate on propagandizing to con the people and manipulate public opinion while having no conscience or real concern for the costs to the people – their political ambitions are their only priority and they have become cocky, arrogant and stubborn about it, secure with their confidence in "the money's" support. The results clearly prove the point with Bush-Cheney totally focused on using their offices and America's resources to serve only "the money", while costing the country and the majority greatly; with the Republican / Tea Party focused on obstructing all efforts, withholding cooperation and refusing to compromise while just belligerently faulting and contributing nothing; and with the growing spread between the very wealthy and everyone else, as "the money" keeps feeding their insatiable "more" (never enough) appetite and the majority struggles always loosing more. If the people, the majority, the voters are continually conned and neglect to see this reality, then the country will continue to become a two class society, with the few competing to have it all while the majority constantly looses more. If the people, the voters don't wake up, they simply will seal their own fate. Lets get the tea party and the occupy movement together!!! Both are against the direction of our current governments. Both are against bank bail outs. You can even say both were tired of the war at the time. Everyone failed in that no one saw the similarities. I was in DC during the Occupy Freedom Plaza. There were sooo many people that came up to me and shook my hand and said great job bringing attention to the corporate bailouts, the endless wars, the foreclosures etc. etc. The media hurt the occupy movement by putting them in a negative light. Horribly negative. They said the occupy movement didn't know what it was asking for!!! All you have to do is do a search on photos of the movement and you will see they wanted jobs, an end to corporate greed, end of the federal reserve, closure of tax loopholes and help with student debt because the jobs weren't there and school costs have gone through the roof. Can't you see it??? And we bought from the media hook line and sinker this garbage that the occupy movement was clueless. I am still shocked at this blatant lie and ashamed at the general public for mirroring this same belief without looking at with their own eyes. The GOP hurt the Tea Party by co opting them. At least they got into Congress and the Senate but I am sure they lost the steam they had before the GOP got a hold of them. The Federal Reserve is still present and the national debt is still high. This is not a left or right thing that the media wants us to believe. We have been duped by Bush and duped by Obama and bought by Clinton. Next time the occupy movement ebbs again, join them in the streets!!! Next time the tea party has a luncheon join them for a cup!!! We need to start coming together in the middle or our United States will remain divided right down the middle. All of our political leaders' talk is just cheap and meaningless! – When will these people finally wake up and step up with real ideas and real action, instead of just meaningless talk and tokenism? These idiots have been avoiding action for 2-3 decades. It seems to me that over the last 2-3 decades that both parties were always able to distract and polarize voters with insignificant peripheral social issues like gay marriage and abortion, which got most voters so caught up in the BS that they'd always lose sight of the bigger picture. If more people would have listened to Ross Perot back in 1992, America wouldn't be in this mess. I and many other people, who were able to see through all of the left vs right BS, did vote for Perot, because he was straight forward and just used common sense. He cared about his country and the American people. Once they're elected, our leaders should be working together for the good of our country and our citizens by using combinations of the best ideas from both sides. – Instead of just trying to make the other side look bad so that they'll lose the next election. – How's that nonsense been working out for the American People and the Real American Economy? Foreign Lobbyists here in the US promote sending US jobs to countries like China, India and Mexico where they work for slave wages, no benefits, no OSHA safety standards or no real environment regulations. It also doesn't help us compete when these company's factories are subsidized by China's communist government. Just check out the current Chinese extreme pollution issues – We all live in the same world, but not every country plays by the same rules. It's all happened because, over the last 25-years, our government has allowed our country's industries to get sucked out to China, India, Mexico, etc and allowed illegal aliens and H-1B foreigners to come into our country and take away tax-paying Americans jobs and wages. They're NOT Elected By or To Represent the Global Market Place, Lobbyist, Foreign citizens or Illegal Aliens. I hope Jeb can beat Hilary. Just because Bill was a decent leader doesn't mean Hilary would be. I don't want the pilot's wife flying the plane, so why would I want the leaders wife in charge? Just because Bush Sr. was was mediocre and Bush Jr. was absolutely despicable doesnt mean Jeb wont be just as much of a disappointment...3rd times a charm? You're talking about the ex secretary of state, she is more than just the "leader's wife," she herself is a leader. Bigot. It's really sad that our country has come to this. Just recently, while looking at a photo of Mount Rushmore – I couldn't help thinking how these great presidents would be angered, disgusted and outraged at what our current and recent crop of so-called "leaders"(Free-Traitors) have allowed and enabled to happen to the American People, the Real American Economy and Our Country. Almost all of our politicians are a joke – Only it's not so funny, because over the past several decades, all they've been doing is screwing the American people, by stalling, spending, removing protections and allowing illegal aliens to continue to pour in and American jobs and industry to pour out, and all while collecting their American tax-payer funded pay checks, benefits and whatever else they get on the side from their various lobbyist friends. Regardless of what the Free-Traitors keep trying to sell us, we can see what's real. The American People need to just trust their own instincts, common sense and what they've seen actually going on all around them versus all of the nonsense that the Free-Traitors are still trying to sell us. They're NOT Elected By or To Represent the Global Market Place, Lobbyist, Foreigner citizens or Illegal Aliens. Hey Free-Traitors: The AMERICAN PEOPLE can see what's been done to them! Let's face it both parties are just doing the bidding of their masters, while lamely trying to look like they're trying to represent us. Wouldn't it be nice, if some of these masters were conscientious loyal Americans who loved their country and cared about their fellow Americans enough that they would finally start pointing their lap-dog-politicians in the direction of doing right by the American People? Maybe that's delusional on my part – But if this doesn't start happening soon, the American people and the future of the country that we love is doomed. Yeah Right – Balanced Budget Bill Clinton left us in great shape – As he sold us out to China and just waited for the damage to start setting in after he was long gone. – How'd that work out for the American People, the future of our country and the Real American Economy? Things may have been better short term as far as stock vales and consumer spending were concerned during the Clinton administration, but that was just a Short-Term Artificial boost to the economy. The Real American Economy and the Future of the American People was on it's way down hill, because of our leaders and that shortsighted Wall Street mentality selling the American People's Jobs Out to countries like China, India and Mexico where it's not even remotely close to a level playing field. Ha – Ha – Ha – "I did not have unethical trade relations with that communist Chinese government." We get the government we deserve! Too many are financial conservatives but socially liberal-can't have it both ways! We've tossed morals and ethics and expect capitalism to work. George Washington: it's impossible to govern without the Bible. Sure, with the ways the parties are crafted at the moment, you kind of have to pick your poison. But at one point there was a financially conservative and socially liberal party. They were the republicans prior to Nixon embracing the religious right (or more accurately, the precursors of that movement). The party of liberal social issues was the GOP for a long time. They were in the lead for things like civil rights... until the democrats purged their dixiecrats and embraced the civil rights movement (as well as other liberal social politics). The GOP could do the same... cast off the evangelical wing entirely and become the fiscally conservative and socially liberal party they were pre-Nixon.